One of the best decisions I've made (in the minimalist department) is owning very few children's books. Anyone who's helped a child pick up books after they've emptied their bookcase understands part of my reasoning. Here's the other part. I don't like to take the same road twice, whether it be a movie or a book. When Chandler and Cadence were wee little, I pushed through to give them the repetition they needed, but it was all I could do to be expressive the twentieth time through the Airplanes book. Ugh. No more, ladies and gents. No more. I owe the guy or gal who thought up the library concept because now, the kids and I take a new adventure every time. I love not knowing where the story's taking us or how it'll end. Have I run into some stories I wasn't pleased with? Yes, and I very poorly reworded the final pages, but overall, it's worth enjoying story time instead of pretending to enjoy it. Because we have an unlimited supply of new stories at the library, we keep only a few precious books on their shelves...all loved either by me or the kids. On one of our recent trips to the library, I picked up a Dr. Seuss book that was new to me called, What was I scared of? When I saw it was a glow-in-the-dark encounter, I was sold. 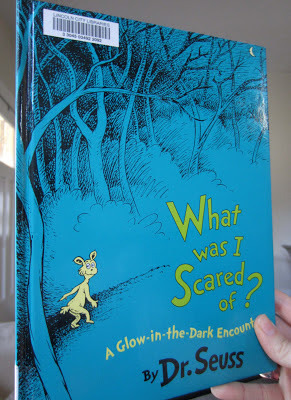 It took a couple days to read it, but when we did, it had the kids rolling and afterward, we'd run into a dark room to see the pictures glow. I said them, but I lied them. I loved that because we try to talk ourselves out of our fears and pretend we're not scared, like somehow, through reverse osmosis, we'll discover we're no longer afraid. If only it were this easy. I have no great answer for this, but lately I'm trying, "Jesus, this scares the poop out of me, but I trust you." No more lying at least. In picture three, the little guy is friends at last with the pants, but I won't give away how that comes about. I love Dr. Seuss. When I listed my favorite children's books I couldn't help mentioning two besides the one on the list. The sing-songy-ness of his rhymes whispers, "It'll all work out in the end." The silliness of his made-up words reminds me not to take it all so seriously. The made-up worlds of the art take me outside the norm and show how lessons that are true transcend all different situations. I'm so jazzed about Dr. Seuss, in fact, that the next Make your Monday will feature one of his best quotes. Here's wishing you a small bookshelf, delightful new adventures and times when you can't stop laughing. Ah...that's the best. P.S. If you follow me on Google Reader, I just found out it's shutting down on July first. If you'd like to try following with Bloglovin, you can import blogs from Google Reader to Bloglovin here.